EU pork exports strengthened at the turn of the year, with January figures showing a 9% (+18,000 tonnes) increase compared to the same month in 2018, reaching 201,000 tonnes. The total value amounted to €444.3 million, up 5%. Increased volumes were largely destined for Asian markets, with the importance of China among EU export markets now increasing again (exports up by 9,300 tonnes). 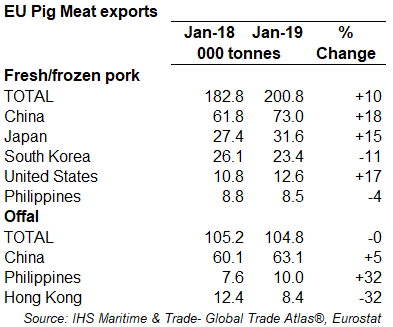 The share of EU pork exports going to China reached 36% during the month, two percentage points higher than last year but still seven percentage points lower than in January 2017. Similarly, Japan picked up 4,200 tonnes more, although South Korea was down by 2,800 tonnes. Anecdotal reports suggest Chinese import demand has continued to escalate in recent weeks, and the US market is trading as if import demand will be sustained at much higher levels. Further growth may become evident in the February data and beyond.